The 49ers signed Tevin Coleman to join Breida (ankle) and Jerrick McKinnon (knee) in the backfield, Jennifer Lee Chan of NBC Sports Bay Area reports. 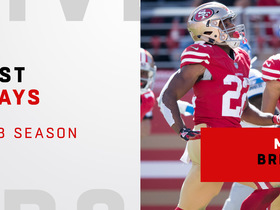 Breida (ankle) is expected to face more competition out of the backfield in 2019 with Jerick McKinnon (knee) returning from injury, Joe Fann of the 49ers' official site reports. Breida (ankle) was placed on injured reserve Saturday. Analysis: The 49ers declared Breida out for the season finale early in the week, so this move is just to add some healthy bodies for Sunday. The 23-year-old was injured throughout much of the season and will leave Jeff Wilson and Alfred Morris to handle backfield duties Week 17. Breida (ankle) has been ruled out for Sunday's game at the Rams, Matt Barrows of The Athletic reports. Brieda (ankle) won't return to Sunday's game versus the Bears. Analysis: Such has been Brieda's fate on other occasions this season, but this one comes in the midst of fantasy championship pursuits. 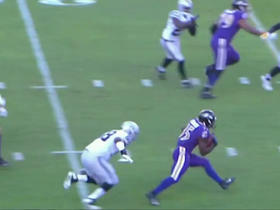 He'll leave Week 16 with four carries for 20 yards and one reception (on one target) for six yards. Jeff Wilson will man the 49ers backfield for the rest of this contest and perhaps in the season finale if Breida's aggravation is serious enough. Breida (ankle) is questionable to return to Sunday's game against the Bears. Analysis: Injured to start the second quarter, Breida was able to walk off the field under his own power before making a visit to the blue sideline tent, and eventually, the locker room. The culprit was again his ankle, which has forced one absence and numerous other in-game departures this season. Expect Jeff Wilson to carry the load in the event Breida doesn't reenter the contest. Breida (ankle) doesn't have a designation on the 49ers' final injury report for Sunday's game against the Bears. 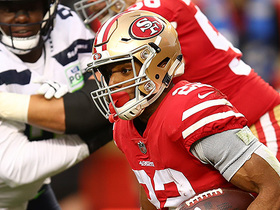 Analysis: Breida will continue playing through the same ankle injury that has bothered him for most of the season, hoping to avoid an in-game setback like the one he suffered during overtime of last week's 26-23 win over the Seahawks. He led the Niners in both carries (17) and receptions (five) during that contest, while Jeff Wilson was limited to seven touches. It's possible the team evens out the distribution this weekend in an effort to limit the strain on Breida's ankle. Breida (ankle) was a limited practice participant Thursday, Matt Maiocco of NBC Sports Bay Area reports. Breida (ankle) was listed as limited on Wednesday's practice report, Nick Wagoner of ESPN.com reports. Breida aggravated his ankle injury toward the end of Sunday's 26-23 overtime win over the Seahawks, Eric Branch of the San Francisco Chronicle reports. Breida (ankle) is listed as active Sunday against the Seahawks. Analysis: On the heels of limited practice sessions all week, Breida is returning from a one-game absence due to an ankle injury that has plagued him for much of the season. He's expected to split the RB workload with Jeff Wilson, a breakdown that allowed Breida to compile 57 yards from scrimmage on eight touches in his last appearance Week 13 at Seattle. Breida (ankle), who is listed as questionable for Sunday's game against the Seahawks, will play in the contest, a source told Adam Schefter of ESPN. Breida (ankle) said he's on track to play Sunday against the Seahawks, Cam Inman of Bay Area News Group reports. "As long as everything keeps going the way it has, they gave me the green light and I'll be ready to go," Breida said Friday. Breida (ankle) is listed as questionable for Sunday's game against the Seahawks, Matt Maiocco of NBC Sports Bay Area reports. Analysis: A limited practice participant throughout the week, Breida appears truly questionable after missing a 20-14 win over the Broncos in Week 14. Another absence would leave Jeff Wilson to handle a large workload, following back-to-back games with 54 or more snaps and 23 or more touches. It will be tough to trust either running back in fantasy lineups if Breida ends up playing, as the 49ers might scale back his workload to decrease the odds of another injury aggravation. Breida (ankle) remained limited at Thursday's practice, Jennifer Lee Chan of NBC Sports Bay Area reports. Breida (ankle) will be limited at Wednesday's practice, Jennifer Lee Chan of NBC Sports Bay Area reports. 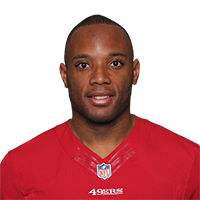 Coach Kyle Shanahan ruled out Breida (ankle) for Sunday's game against the Broncos, Cam Inman of The San Jose Mercury News reports. 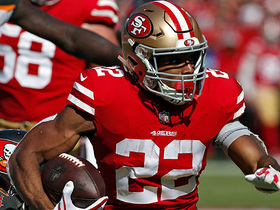 Coach Kyle Shanahan said Breida aggravated his ankle injury during pregame warmups for Sunday's 43-16 loss to the Seahawks, Eric Branch of the San Francisco Chronicle reports. Analysis: This is the obvious explanation for Jeff Wilson piling up 134 yards on 23 touches while Breida was limited to six yards on five carries and 51 yards on three receptions. The second-year pro had no problem playing through shoulder and knee injuries in September, but the ankle issue has continued to pop up throughout the season. Sitting at 2-10 ahead of a Week 14 game against Denver, the 49ers might want to consider allowing to Breida get some rest. Breida gained six yards on five carries and 51 yards on three catches in Sunday's 43-16 loss to Seattle. Analysis: Breida took a clear back seat to Jeff Wilson, who piled up 134 yards on 23 touches (eight catches) despite exiting the game at one point to be evaluated for a foot injury. Wilson re-entered the contest and continued dominating the backfield work, while Breida was in and out of the game all afternoon. It may be time for the 49ers to consider resting their top running back, even though he's often been effective while playing at less than 100 percent. San Francisco will host the Broncos in Week 14. Breida (ankle) doesn't have a designation on the 49ers' final injury report ahead of Sunday's game in Seattle. Breida (ankle) was limited at Wednesday's practice, Cam Inman of The San Jose Mercury News reports. 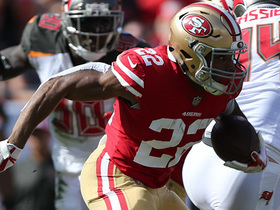 Breida rushed 14 times for 106 yards and brought in three of four targets for 34 yards in the 49ers' 27-9 loss to the Buccaneers on Sunday. Breida rushed 17 times for 101 yards and a touchdown and caught three of four targets for 31 yards and another score in Monday night's 27-23 loss to the Giants. Breida (ankle) rushed 12 times for 41 yards and brought in his only target for three yards in the 49ers' 34-3 win over the Raiders on Thursday. He also recovered a fumble. Breida (ankle) is listed as active Thursday against the Raiders. 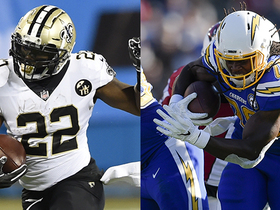 Analysis: Per usual, Breida is playing with his health compromised, but it hasn't stopped him from leading the backfield most weeks this season. In a Week 8 loss at Arizona, he handled 31 (of 66) snaps on offense, which was nearly three times the usage of fellow running backs Raheem Mostert (12) and Alfred Morris (11). With Mostert tending to an ankle injury himself, Breida seems like a safe bet to maintain the upper hand in the 49ers backfield. Breida (ankle) is expected to suit up for Thursday's game against the Raiders, Adam Schefter of ESPN reports. Analysis: There's little question the banged-up running back will be available, as he's played through all manner of injuries this season. Due to the presence of Raheem Mostert (ankle) and Alfred Morris, though, Breida has a bit of competition for reps. Moreover, there's the distinct chance Breida spends time with the medical staff at some point during the contest, capping his potential. 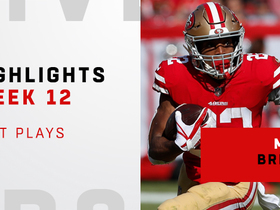 Watch the best plays from San Francisco 49ers running back Matt Breida in his 2018 season. San Francisco 49ers running back Matt Breida is able to get pass and force Seattle Seahawks linebacker Bobby Wagner's first miss tackle of the season. 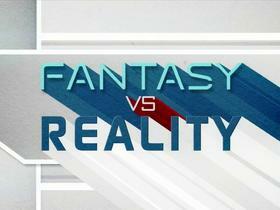 The "NFL Fantasy Live" crew predict their Week 16 game scripts and how they will affect fantasy players. 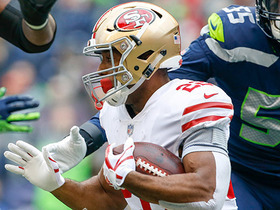 San Francisco 49ers running back Matt Breida sprints for a 26-yard pickup after catching screen pass vs. the Seattle Seahawks. 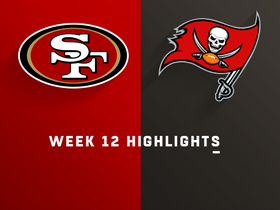 Watch highlights from San Francisco 49ers running back Matt Breida against the Tampa Bay Buccaneers for Week 12 of the 2018 season. San Francisco 49ers running back Matt Breida rushes for a 21-yard gain against the Tampa Bay Buccaneers. San Francisco 49ers running back Matt Breida rushes for a 33-yard gain against the Tampa Bay Buccaneers for Week 12.